War is death to the truth. Any plausible lie will do to advance the cause of one side or the other. An example is the Soviet execution of some 22 thousand Polish officers at Katyn forest as it cemented its rule following the 1939 pact with Nazi Germany – one after another shot in the back of the head and pushed into a mass grave. But we didn’t do it, claimed the Communists. The Nazis did. And for many years later, they were generally believed. The Nazis, to be sure, were capable of any sort of atrocity, so the lie had a certain standing. Trouble is it contributed to a misunderstanding of the Soviet Union, an underestimation of Stalin’s grim plans for conquest and occupation. The West was unprepared and suffered the consequences. The “good war” that demolished Hitler strengthened Stalin, not only in Europe but elsewhere in the world. The unexpected Cold War was on. In their urge to win World War Two, the West’s leaders tended to sentimentalize Stalin who was fighting on their side. He became “Uncle Joe” to Americans from President Franklin Roosevelt on down. Just a good hearted, somewhat bumbling ex-peasant struggling to be a democrat like the rest us, when in fact he was one of history’s coldest mass murderers. Roosevelt tried to reassure him about Poland as it came under Soviet control. Don’t worry about the criticism you get, he confided, I have to worry about the Polish vote in America. British Prime Minister Churchill, engrossed with the rapidly disappearing British Empire, was equally dismissive of the country that really didn’t belong anywhere. For a number of years in the late 18th century, in fact, Poland didn’t exist, its territory parceled out among the great powers. But nothing was quite so intense as Polish nationalism, celebrated in song and story from childhood on. With the Treaty of Versailles in 1919 that ended the First World War, the nation was recreated and reaffirmed. The future seemed bright. Poland was here to stay in all its splendor. But it was not to be. Conditions left by the monstrously destructive war led to the rise of the totalitarians, and both set their sights on the country between them. Easy pickings, they thought. Hitler’s invasion of western Poland, followed by Stalin’s thrust into the east, launched history’s most cataclysmic conflict, and no country suffered more than Poland. It became a kind of putty in the hands of the two tyrannies as they advanced and retreated over its soil, reshaping it this way and that, shifting its borders, killing people by the millions. In the end it was claimed by the Soviets who clamped on their usual iron regime. The West did nothing for Poland during the war or after. But Poland characteristically helped itself. It seethed under communist rule and in 1980 exploded in the formation of Lech Walesa’s Solidarity movement. Supported across the country, this new found power signaled the collapse of Soviet rule in all of Eastern Europe and in Russia itself. Poland led the way. Today it enjoys a strong economy and general prosperity. Its democratic politics are passionate with a current rise in nationalist fervor. It has some difficulties with neighbors like Russia and Israel but no threat to its existence and staunch backing by the U.S. Once prostrate and divided, Poland is flourishing, and that’s no lie. An excellent article by Ed Warner. During World War II, the U.S. government-funded Voice of America (VOA), where I was in charge of the Polish Service in the 1980s and where Ed Warner worked as an editor during the same time, was controlled by American and foreign Communist sympathizers, admirers of the Soviet Union, fellow travelers, and a number of Communist Party members. These apologists for Stalin blamed the Poles and their democratic Government-in-Exile in London for asking for an international Red Cross investigation of the Katyn Massacre after the mass graves were discovered by the Germans in 1943. Hollywood playwright and President Roosevelt’s speech writer, Robert E. Sherwood, later described as the “founding father” of the Voice of America, even accused the non-Communist Poles of becoming Hitler’s supporters. Polish soldiers in the Middle East and in Italy were at that time fighting against the German armies. Poland was the first country attacked by Hitler at the start of World War II on September 1, 1939 and by the Soviet Union in September 17. Hitler and Stalin were then allies who in August 1939 had agreed to invade and partition Poland. Hitler later broke his alliance with Stalin and attacked the Soviet Union in June 1941. Soviet Russia then became America’s most important military ally against Germany. President Roosevelt betrayed promises made to the Polish government and Polish Americans and secretly agreed to Stalin’s demands to give the previously occupied territory of eastern Poland to the Soviet Union. The Voice of America broadcasts continued to promote the Soviet Katyn propaganda lie for the rest of the war. The man later known as the first VOA Director, future Hollywood actor John Houseman, hired his Communist friends to work on radio broadcasts. The State Department managed to force his resignation, but many Soviet sympathizers continued as VOA journalists. After being moved to the State Department in 1945, VOA censored news about Katyn in an attempt to obscure the Soviet responsibility for the mass murder. VOA was strongly condemned for these actions in 1952 by the bipartisan congressional committee which investigated the Katyn Massacre. It was known as the Madden Committee, named after its chairman, Democrat from Indiana Rep. Ray Madden. Only then, VOA started to report at greater length on the historical truth about Katyn, but later VOA’s management once again reverted to limited censorship of Katyn-related news. Only during the Reagan administration, all restrictions on reporting on the Katyn story were finally removed at the Voice of America. Fortunately, Radio Free Europe, also funded by American taxpayers, never restricted its reporting on Soviet crimes, including Katyn. 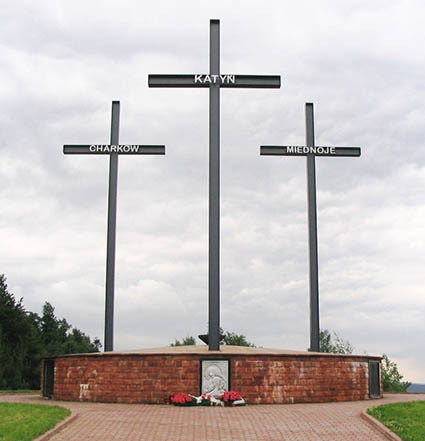 RFE reports about Katyn are truthful, frequent and comprehensive. In a historic irony, left-leaning VOA writers and editors today are praising American Communist Angela Davis who for years supported various Soviet propaganda lies and received the Lenin Peace Prize. One of the first VOA news directors who promoted the Soviet propaganda lie about Katyn during World War II was Howard Fast. He was an American Communist and future winner of the Stalin Peace Prize (worth about $235,000 in today’s dollars). Stefan Arski was another Communist who had worked on the Polish desk of the Office of War Information (OWI) which was in charge of radio broadcasts later known as the Voice of America. He returned to Poland after the war where he continued to defend the Soviet Katyn lie, produced anti-American propaganda and attacked the Voice of America Polish Service which by then hired several outstanding anti-Communist broadcasters, including the legendary anti-Nazi fighter Zofia Korbońska. While for many years they could not report fully on Katyń until the policy and management changes introduced during the Reagan administration lifted the partial censorship, they tried their best to keep the memory of the Katyn victims alive with occasional VOA programs. Free Press Matters.